(A paper read at St. James’s Hall on June 6, 1895, published in pamphlet form by Messrs. Spottiswoode & Co., New St. Square. June 13, 1895, reprinted in ‘Colour Music, the Art of Light’, by A.B.Klein, Lockwood, London, 1930, pp 256-261. Perhaps as the instrument I am about to show you, and the art which it has rendered possible, are so entirely new, you will allow me to say a few words in explanation. Very briefly, my aim has been to deal with Colour in a new way, and to place its production under as easy and complete control as the production of sound in Music. Until now colour to a large extent in nature, and altogether in art, has been presented to us without mobility and almost invariably associated with form. Colour combined with form has constituted the whole colour art of the world. In painting colour has been used only as one of the elements in a picture, although perhaps the greatest source of beauty. We have not yet had pictures in which there is neither form nor subject, but only pure colour. Even the most advanced impressionism has not carried us thus far. In decorative art colour has, broadly speaking, held the same position. Moreover, to obtain particular tints of colour it has been necessary to mix them laboriously on the palette or in the dye-house. Art hitherto has not been able to compete in any sort of way with Nature in the mobility of her multi- tudinous and ever-varying combinations of colour. There has, in fact, been no pure colour art dealing with colour alone, and trusting solely to all the subtle and marvellous changes and combinations of which colour is capable as the means of its expression. The object of the present invention is to lay the first stone towards the building up of such an art in the future. The chief problem, then, that the new art sets itself is to introduce mobility into colour, and with this changefulness, the three great influences of Time, Rhythm, and Combination, slow or rapid and varied. Colour thus is freed from the trammels of form, and dealt with for the sake of its own loveliness. To turn to the practical side of the matter, how has this been made possible ? Many here present are men of great scientific eminence, and there are others again to whom the science of light and colour is familiar. To these I must apologize for touching upon a few simple facts, in order to make the matter clearer to those of my guests who do not possess this special knowledge. Let me then begin by saying that to deal in this way with colour we must go to the source of all colour – namely, light. If we take a ray of white light, we have that which contains every colour in nature. Such a ray may be split up into all the colours which compose it, by being passed through a prism and spread out into what is known as the spectrum band ; which I propose to show you in a moment. Any tint or shade of colour may be obtained by re-combining in the required proportions the simple colours which you will see in this band. Here is such a ray produced by the electric arc. Pass it through a pair of prisms, and it is spread out into the spectrum band you see before you. In the instrument I have invented, and which I propose to call the ‘Colour- Organ,’ I have taken a certain number of points, at carefully calculated intervals, along the whole length of this spectrum band, and have devised means for obtaining the colour at these points as accurately as possible, in much larger quantity, and in variable intensity. The colours thus selected have been placed under the control of a keyboard like that of a pianoforte. I do not here propose to trouble you with a description of the rather delicate mechanism which intervenes between this keyboard and the diaphragms which filter out the colours required, and which has been a source of great difficulty in the construction of the instrument, but suffice it to say that, upon the depression of any note, the corresponding colour by these mechanical means is projected upon the great screen at the end of the hall. Thus each note of the keyboard has its own distinct and permanent colour corresponding to the proper interval on the spectrum band, just as each note of the pianoforte has its own distinct musical sound. The keyboard is, in fact, a large palette from which we can paint with instantaneous effect upon the screen – the colours being at will combined into one chord, or compound tint, upon its surface. I now come to an interesting side of the subject, which, however, may easily be misunderstood. As I have said, this new art introduces three novel elements into the use of colour – viz. time, rhythm, and instantaneous combination. It is evident these three elements are associated with one other art only – namely, music. Notes of music and notes of colour can in these respects be treated in exactly the same way. Hence the adoption of the term ‘Colour-Music’ – being impossible to find any other which would sufficiently describe the new art. There are, however, other reasons for attempting to use colour as we use musical sounds, but about which there will be some divergence of opinion. I am, however, desirous of referring to them in a few words, because it was my great interest in this side of the question which first turned my thoughts to the study of the whole subject. At the end of this paper I have quoted a number of scientific opinions on this and other points, which I need not trouble you with now. I will therefore pass to the second and equally remarkable analogy between the octave of colour and the octave of sound. If we measure the rate of vibration at the first visible point at the red end of the spectrum, we shall find it is approximately one-half what it is at the extreme violet end. Now in music, as we all know, this relationship is the same. If we take the first and last notes of an octave (by which I mean the twelfth) the latter has nearly double the number of air vibrations – and the first note of the new octave has exactly double. This, as we have seen, is the case also with the spectrum band so far as the one octave is concerned ; the lowest red stands for the first note of the octave, and the highest violet for the twelfth or last note. Further than this, the blue end of the spectrum shows a tendency to a return to red in the violet, and the red end of the spectrum shows a similar tendency towards a reappearance of blue, in the fact that it passes from scarlet to carmine before it fades away, so that Sir John Herschel and others may have been right when they surmised that, if our eyes could see them, the colours of the visible spectrum would probably repeat themselves in successive octaves, in the great invisible portions beyond the red and the violet. Starting from these remarkable physical analogies, I have divided the spectrum band into diatonic intervals or notes, on the same plan as that of the musical scale. These intervals I will now show you approximately, by drawing a black screen in front of the white one, with slits in it roughly corresponding to these carefully calculated intervals or notes of the colour octave. You will observe that these points are unequal in distance. This is because the rays of the spectrum are unequally refrangible, but the colour notes are, as nearly as can be calculated, separated by equal intervals of vibration. It will be a question of opinion, and of further experiment, whether the close physical analogy between the octaves of colour and sound has its physiological and Psychical counter-part. Perhaps our eyes, as a well-known musician has suggested to me, are not yet sufficiently educated to make us competent judges, but the new art is not dependent upon its demonstration. As a working theory the analogy has its uses, and for this reason I have constructed the new instrument upon it. 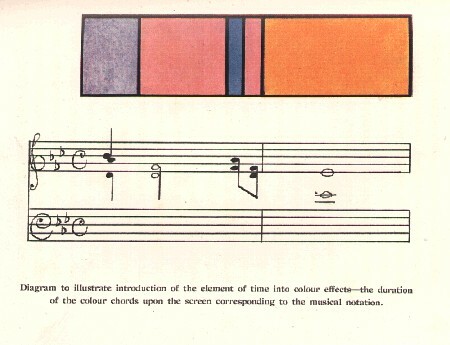 The possession of a keyboard similar to the musical one renders it possible to write colour compositions upon the same system of notation, and what for the present is important, to translate musical scores into colour, and make use of the beautiful rhythmical works already in existence for the interpretation of, and to help in the development of, the new art. The middle C having usually been the note selected for fixing the pitch of a keyed instrument, it would seem natural to take it as the first point of contact between the two scales. 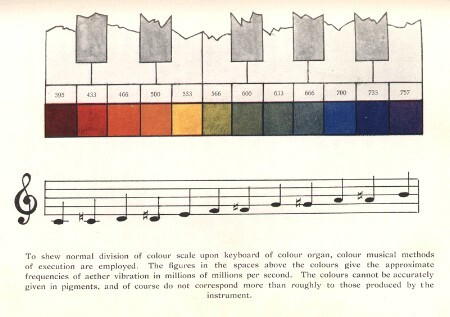 In thus translating sound music into colour music, I have found that it adds much to the enjoyment of the colour if the music is simultaneously rendered into sound, and it is curious to note how extremely sensitive the eye soon becomes to the least divergence of time or accent. That colour, like sound, is capable of expressing artistic emotion there can, I think, be no question, but whether it expresses it in the same way as music is doubtful. It is, however, a somewhat strong argument in favour of the existence of the physiological and psychical analogy, that when we avail ourselves of the works of great musical composers for the interpretation of the new art, the results are vastly superior in variety, delicacy, and beauty of colour to those hitherto obtainable by other methods. If this discovery be, as I claim, a new art, it is evident that the science of its interpretation still remains to be constructed. The principles which underlie its artistic and scientific application have still to be determined. Some investigation and experiments I have made, but time has been too short to allow of any definite results being arrived at. In the meantime till such research can be pursued, completed, and applied, there is an immense store of beauty in the musical works we already have. But the question will be asked, What are the uses of this new art ? In reply, I would venture to ask, What are the uses of any art ? Are they not to ennoble, to refine, to increase the pleasures and interests of life, to educate the special sense or senses to which they minister ? All these missions I venture to claim for the new art, although I admit to the full that time and experience alone can show the full range of its utility and possibilities. The following brief, but remarkable and curiously prophetic expression of opinion, by a well-known author, confirms this view. It was written twenty years ago, but strange to say I had no knowledge of its existence until a few weeks since, and after my invention was completed. You will observe that it attacks the subject from the emotional side. ‘The only possible rival to sound as a vehicle for pure emotion is colour, but up to the present time no art has been invented which stands in exactly the same relation to colour as music does to sound. No one who has ever attentively watched a sunset can fail to have noticed that colour, as well as sound, possesses all the five qualities which belong to emotion. . . .
‘Colour now stands in the same kind of relation to the painter’s art as sound amongst the Greeks did to the art of the gymnast. But just as we speak of the classic age as a time long before the era of real music, so by and by posterity may allude to the present aae as an age before the colour art was known ; an age in which colour had not been developed into a thing of pure emotion, but simply used as an accessory for drawing as music was once to bodily exercise and rhythmic recitation. I had hoped that the writer, Mr. Haweis, might have been present this evening, but he is unfortunately away from England. I would ask you to make some allowances for the fact that to-night, for the first time, your eyes will be called upon to appreciate colour under new and unaccustomed conditions. As only a well-trained ear can fully enjoy the subtleties of music composition, so with the eye generally in the new art is now called upon to appreciate the perhaps still greater subtleties of ‘colour-music.’ Therefore I think it is likely that to some (though I have not yet found any one) the new art will not appeal at all, and that others will have but a very partial enjoyment of its beauty. Still I believe that, as it educates the eye, there will be increasingly few to whom it is not a new and keen sort of pleasure, for it will, as has been predicted, sooner or later take its place with painting, music, architecture, or any other of the great arts. There are some industrial uses to which the instrument might be applied to which I might refer did time permit; such, for instance, as a means of testing combinations of colour for decorative designs, etc. ; but with these I will not trouble you further than to say that they open up an interesting field. Form has ever been felt to lend an added charm to colour, and in the new art can be produced in many beautiful and interesting ways, introducing infinite variety and relation of colour. The art in this connection is capable of great development. When, however, the element of what I call mobility is introduced into the production of colour as in the rendering of a piece of colour-music, it is a moot point if in any degree, or in what degree, the addition of form is to be desired. During the experiments I have made it has been argued with some force that an undetecting eye has a sufficient task in its efforts to measure, compare, and appreciate mobile colour to a perfect performance of which it is more or less unequal, and that any additional element such as form, ‘however beautiful in itself,’ becomes distraction which hinders rather than aids its perceptions. The question of the introduction of form I do not pretend to determine, and I shall show colour-music with and without it. Turning to another point, it will be apparent to all that the eye rapidly attains some education. I think you will all find that by the end of the evening you can appreciate intricate colour variations with far more pleasure than at the beginning. I have said that to a large extent in nature colour is presented to us without mobility. Exceptions to this proposition will easily occur to us. Who has not experienced the profound emotion, partly joyous, partly melancholy, produced by the grand procession of glorious colour schemes presented by many a sunset ? Here the changes are for the most part slow and solemn ; red becomes orange, orange becomes gold, gold melts to delicate green and blue by almost imperceptible transmissions. Numberless combinations and proportions of every colour, in ever varying and progressing harmony march with slow and stately measure into the night. Or again look at the restless sea, on a bright and boisterous day, with cloud squadrons charging overhead, how infinite and magical are the colour schemes presented to us! How glad and sparkling the emotions we experience ! How different from those called forth by the pageant of the dying sun ! Then our perception of beauty was tinged with a pathos that deepened as light yielded to darkness. Now we watch the quickest movement of a symphony where the variations are even too rapid for the eye to follow. No rest, no pause in the mazy changes of colour ; the former is a procession, the latter a dance. Or again, combine the two ; spread the rippling sea beneath the setting sun-how infinite in beauty and complexity becomes the very opera of colour ! Did time allow, I might multiply examples. These colour compositions of nature are under the influence of form, gradation, and combination. No contrivance of earthly art can hope to rival in some directions these glorious manifestations of Nature. But there are two qualities of mobility which I think have no influence over colour as presented to us in the natural world. I mean the influence of time in its musical, and rhythm in either its musical or poetic sense. In introducing these, the new art stands alone. Such, briefly sketched, are the principles, aims, and methods of the new art. From sound man has developed music, that glorious art which has done an infinity to elevate the human race ; but music is not with us always, or, at any rate, our dull ears perceive it not. But how is it with colour – with light, for the terms are synonymous ? Colour is with us all our waking hours, – colour is of the essence of the beauty of this world. Surely, then, this all-pervading gift will lend itself to the high purpose of a great art whose influence shall be as deep, as far-reaching, as elevating as that of any of her sisters. I claim to have done no more than to give the first suggestions of its principles and possibilities. Only after the toil and travail of many minds, perhaps through many years, can we expect to see whither it will lead, or hope to approach its realization.